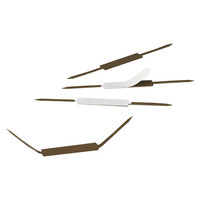 Smead Self-adhesive 2-3/4 in C-C Prong Fastener can easily hold up to 2 in of paper and offers a quick/easy way to sub-divide materials within a folder or to keep papers in sequential order. Fastener with a brown enamel-finish metal is great for use in binders or brief covers, on bulletin boards or where ever papers need to be periodically posted. It can be added to any style of folder to improve the functionality. This self-adhesive's backing strips can be removed easily by releasing the coat sheet and pressing against folder. It can also be applied through pre-punched slits for extra strength in folders that need to hold large amounts of paperwork. This fastener can also be applied to the inside panel of the folder for general filing applications, sold as 100 per pack.